For Businesses looking for a solid rebranding strategy, here are insights on how to build billion dollar brands. For me, billion dollar brands make me think of the unicorn. A mythical, magical creature with a beautiful shiny horn, a pristine white coat and gilded wings for flying. Sound familiar? I bet you’re not as familiar with the lesser known story of the albino rhino: a gigantic white, scaly, wingless, awkward beast with a crooked horn that lives alone. Sound familiar? No? Didn’t think so. Imminent extinction has to be one of the saddest brand differentiators we can think of. Albino Rhinos represent brands in decline for lack of attention, creativity, and imagination. Instead of innovating, instead of digging deep for the gold, some product manager or engineer thought that being rare and unique was enough. Our magical friend the Unicorn, on the other hand? Hello, cultural icon. Hello, awesome pony. Unicorns represent brands with pizazz, humor, imagination and heart. Unicorn vs Albino Rhino is not an uncommon branding scenario. Essentially, we have two similar creatures. But with the Unicorn, we used braces to straighten the crooked horn, Pilates to lengthen and strengthen, gave it a good rinse and a buff, and added a new pair of wings. According to Fortune Magazine (Jan. 2015): The Age of Unicorns has Arrived. 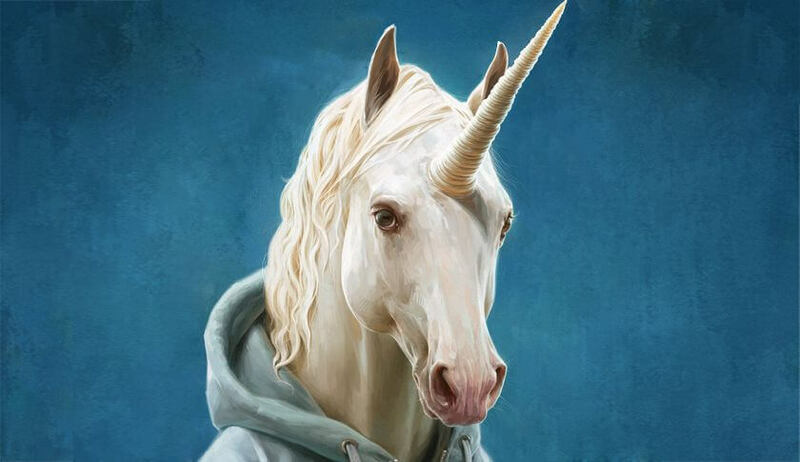 By definition, unicorns are startups with $billion valuations. “The billion-dollar tech startup was supposed to be the stuff of myth. Now they seem to be … everywhere. But more aggressive fundraising is no guarantee that unicorns will grow into their valuations.” Identifying and branding your unicorn potential is often the key difference between success and failure. You can’t settle for being unique; it may lead to extinction. Instead, dig deeper and discover your brand’s inner unicorn. Creative brand advertising can connect with ideal target markets for your business brand is essential because your consumers are your future success and growth of your business. Whatever your brand’s mission statement is, identifying and winning the devotion of your target audience is the vital means to achieving your brand objectives. We will help you learn how to identify your brand values to craft your unique value proposition. HiveMind Studios can step into the level of your brand building process at whatever stage you are at. Inconsistent brand messages are the bane of good branding. Volvo is a stellar example of a company brand that crafted its brand on safe travels for families. Its commitment to safety in its brand positioning has permeated into all corners of their communications, from product design to advertising. They demonstrate a manner of renewed digital messages that keep the life in their brand. In today’s fast paced world, dominated by information avalanches and increased web insecurities, a brand’s values, quality and genuineness continue to grow in importance. Consumers seek meaningful and trusted relationships with their favorite brands. Billion-dollar brands are busy with strategic plans for the predictable and unpredictable well ahead of launch. Care is taken used to make use of every opportunity to reinforce brand alignment. With the incredible rise of social media and real-time brand positioning in a digital world, the key is to leverage natural moments that may bring your brand into the spotlight to capitalize on and dominate as a hot topic. The result of brand personality and brand identification on brand loyalty includes a strong brand footprint on social media. Remember how Oreo Cookies napped international attention with the lights went out during the 2013 Super Bowl? It is mission critical that the final products and services your business presents tot the world are something you can deliver on. Your brand promise should invoke a vision of a consistent product that the consumer looks forward to a great experience and can count of you for years to come. Mars’ M&M’s new strawberry peanut butter M&M flavor was revealed on the heels of the launch of the latest “Transformers” movie. Disney debuted new “Star Wars” goods, hailed as “Force Friday” to ride on their movie premier. TPT television has maximized its exposure following the enormous success of Downton Abbey. Billion-dollar brands plan for the predictable, but also identify moments or events that can be used to reinforce their position. With the incredible rise of social media and real-time brand building in a digital world, the key is to leverage the unpredictable and bring your creative brand image into the spotlight to capitalize on and own a trending topic. The typical billion dollar company learns early on how to maintain relationships with their customers by being aware of simple truths of human nature. A brand that at its onset answers a basic need and then extends all the way up to making our hopes, dreams and wishes has earned a spot in brands hall of fame. Billion dollar companies succeed in helping individuals come to know those hopes, dreams and aspirations. “Shopping is an experience in which people act out their innermost hopes, dreams, aspirations, and desires”, states Dallen J. Timothy in his book Shopping, Tourism, Retailing and Leisure. You need a creative branding agency that not only understands the customer journey but how to develop an online marketing strategy that boosts your brand. We can help! Ask us about our Rebranding Ebook today! Identifying and branding your unicorn potential is often the key difference between success and failure. You can’t settle for being unique; it may lead to extinction. Instead, dig deeper and discover your brand’s inner unicorn.